For a lot of people the day following St. Patrick’s Day is about trying to function at work while feeling the effects of drinking large amounts of green beer, but for me it’s different. 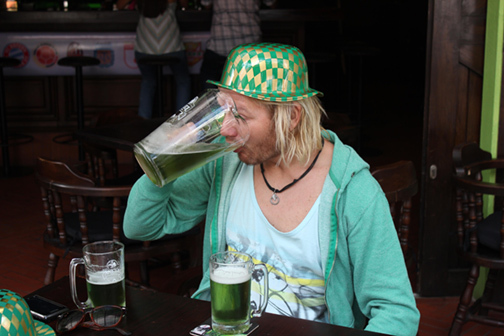 I’ve never been very big into St. Patrick’s Day and can honestly say I’ve never had a green beer. Or is it that I just don’t remember it? All I know about St. Patrick was he’s the dude who played his flute (or something) and got all of the snakes out of England Ireland, but apparently even that’s wrong. Regardless, the extent of me “celebrating” the day is me wearing a green shirt and making a batch of corned beef and cabbage in the Crock Pot. I had never even heard of corned beef and cabbage before I moved to Chicagoland over 15 years ago. Tammy and her family introduced it to me during their big St. Patrick’s Day celebrations. Tammy loved it so much that we’d often make our own to eat AFTER having gone to her Mom’s for it. Since we moved to Memphis a couple of years ago, we’ve continued the tradition of Crock Pottin’ some corned beef and cabbage. 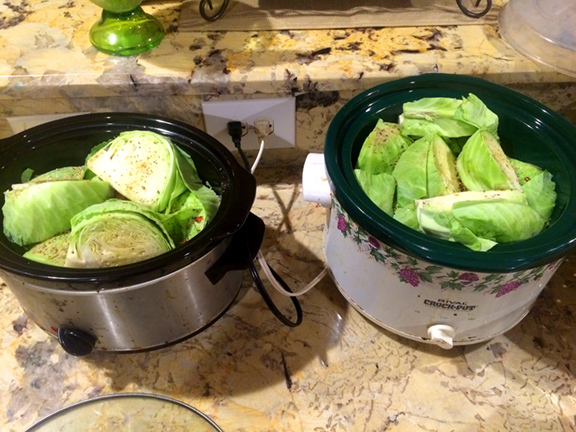 This year I made two Crock Pot’s worth of St. Patrick’s Day goodness. Since we opted for a smaller (code word for cheaper) piece of meat, I decided to add extra cabbage (two heads) with the carrots and potatoes to help make up the difference. We both devoured our first helpings and went back for more. Since there was an abundance of cabbage, I went all veggies on round 2. We were both regretting that decision about an hour after eating. I wasn’t feeling much better and it didn’t take long for my stomach to sound like it was sending out whale mating calls. Seriously, it’s never a good sign when it feels like your stomach is moving on the outside. Regardless of our bloated and shaky bellies, we both were looking forward to eating more the next day. I made two lunch-sized portions for each of us, but Tammy opted to save hers for dinner. I decided to take mine to work. When most of my department was at lunch I slipped into the break room to warm it up and instantly regretted it. Not because of how it would affect my stomach, but because I knew it would smell like I had opened a container of farts. I knew if I REALLY heated it up then the smell would waft through the department, so I decided to only nuke it for about 15 seconds. Heating it up more than that would have caused people to look around and wonder if someone had just crop dusted them. I snapped the lid back on and quietly made my way back to my cube. I kept my head down and avoided eye contact with anyone, which prolly made me look even more guilty. When I got to my desk I opened the lid and shoveled in as much cabbage, carrots, potatoes and corned beef I could fit in my mouth and quickly closed the container. … I haven’t eaten any more. Regardless of how good it tasted and how much I loved it, it’s not worth having everyone in a 4-cube radius thinking I just dropped a gut grenade. Next year I’ll try to remember to bring a sammich to lunch the day after St. Patrick’s Day. Gallery | This entry was posted in Daily Life, Food and tagged coworkers, daily life, fart, food, humor, life, people, St. Patrick's Day, Tammy, work. Bookmark the permalink. There’s not much too it really. I put some garlic salt and other spices on the corned beef then throw it in the Crock Pot with some quartered cabbage, potatoes, and carrots. Then sprinkle in the spice pack that comes with the meat and fill with water (sometimes I add a beer) until the meat is covered. Yes, I did get your email about joining the NCAA Brackets pool, I just couldn¹t find the time to get it done this year, and just wasn¹t feeling it. Things are hectic busy here right now, as a few projects are winding down and the FTP dates approach (tomorrow for one book, Mar. 30th for another). I still want to be a part of this though, and hope I¹ll be included in the email you send next year. FFL tip: You may want to consider RB Darren McFadden. Kid was awesome at Arkansas, injury prone, but he was trying to make it work running behind an awful Raiders O-line. Now he¹s got the Cowboys O-line. HUGE difference. Just throwin¹ it out there.